Frank Lloyd Wright was one of the most influential American architects in the 20th century, and his impact is still felt in many of the buildings that are being built today. Born in Wisconsin, he got his start in Chicago after the famous 1871 fire that left much of that city devastated. But it was after he married and moved to Oak Park across the Chicago city line that he began to really build his reputation of an architect of renown. During his 20 years in Oak Park, he developed his style and designed several buildings that are considered landmarks in the history of architecture. 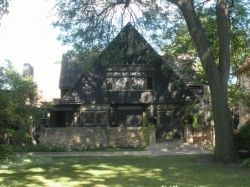 Today, his Oak Park home and studio (see photo) are open to the public and provide a great opportunity to learn more about this famous architect and his influence on the buildings that we all live and work in. The photos here are by us unless otherwise noted. Frank Lloyd Wright first built his home in 1889, after he got married at age 22. But the tour guide said that he never actually was satisfied with the building, expanding it over the decades and using it as a laboratory to try out different ideas. 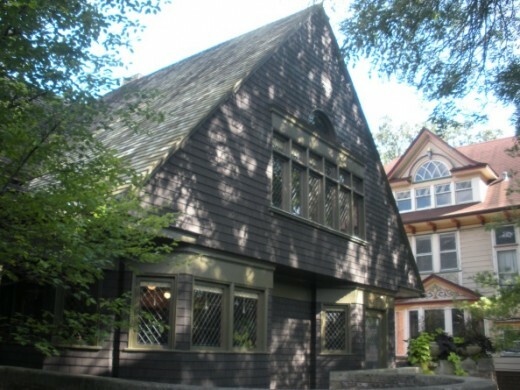 The studio annex was added in 1898. Today, the home has been restored to the way it looked in 1909, the last time the Lloyd Wright lived in the house. The tour begins on the sidewalk out front, where the guide points out one of the first distinctive touches that Lloyd Wright developed for his buildings. The entranceway is recessed and almost hidden from the street, so passersby take in the building as a whole without the focal point of a door. 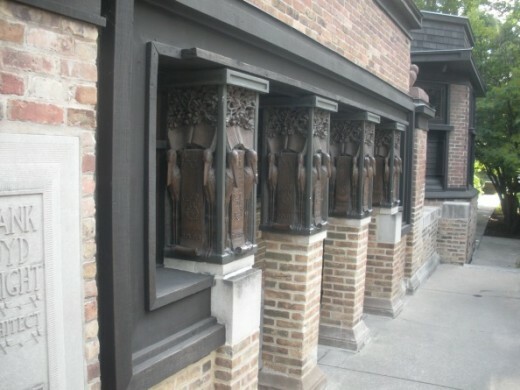 This would be a common feature of Lloyd Wright homes. The first thing that impresses you when you enter the home is how open the space is and how modern the layout seems. The same light green colors and wood trim dominate throughout the downstairs, creating the feeling of more space and flow. In the center is a fireplace that splits the downstairs rooms. Built-in benches that can be hidden by a curtain create a cozy private space if wanted. Above the fireplace is the saying: ``Truth is life. Good friend, around these hearth-stones speak no evil word of any creature.'' Nice thought for a home in any era. 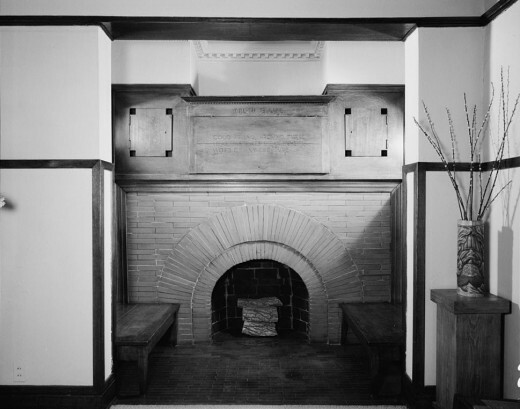 The photo above is a public domain one of the fireplace. It was taken by the government's Historic American Buildings Survey and is credited to Library of Congress, Prints & Photographs Division, ILL,16-OAKPA,5-5. We include it here because, unfortunately, the only photography allowed when visiting the Frank Lloyd Home and Studio is for personal use (and you have to pay extra on the tour for it), so we didn't take any photos inside since we weren't sure how the foundation that runs the place would consider this review. The tour on the first floor continues into the dining room, which is highlighted by what might have been the first recessed lighting in the U.S. when it was installed in 1895. Lloyd Wright also designed furniture for his homes, and in this case he used tall-back chairs around the dining room to create an intimacy for the people eating. The back of the chairs extend high enough that they would hide anyone sitting at the table and block out the view of the rest of the room. The tour continued upstairs to the children's room (the second-floor room under the gable). Lloyd Wright didn't like attics, so he created a barn ceiling for the room and once the number of his children increased (he eventually had six) he divided the space with a half-wall about seven feet high. (A bit higher than most office cubicles but reminiscent of them anyway!). He continued the barn-ceiling idea for the main bedroom. In an unusual touch, he added walk-in closet between the rooms as a noise buffer. But the highlight of the upstairs is the children's playroom added in 1895. The photo above, from the Historic American Buildings Survey, gives you a flavor of how magnificent the room is -- though the room isn't quite the same as the photo. Instead, the space has been returned to what it looked like when the children were indeed playing there. One thing that jumps out at you are the room's windows, which Lloyd Wright has along both sides of the room at very low levels -- about two feet high -- that would enable a young child to sit or lie down and watch the world outside. To the side of the room's entrance is an open area filled with theatre seats where an attic would normally be above the staircase to downstairs. This is where adults could sit and watch the children play while staying out of the way. The tour guide tells us it is also where guests would sit when the family entertained with live music. One of the neater touches is the room's grand piano. Lloyd Wright had a section in the wall cut out and inserted the main part of the piano into a space above a staircase so it wouldn't take up much room. Very clever! After touring the house, we walked around to the entrance of the studio annex. 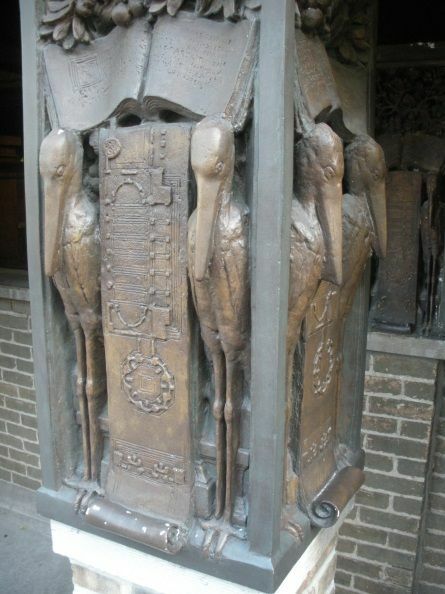 The entrance, per Lloyd Wright's belief, is hidden by columns adorned with storks. Inside are three main rooms: Two octagonal spaces with a rectangular room in between. The rectangular room is where visitors and potential clients would wait, while to one side in the larger two-story octagonal room is where his artists and draftsmen would work. Lloyd Wright was an equal opportunity employer, with several women working under him that made a mark in the architecture field. The open room is magnificent, and obviously done to impress visitors with its long narrow windows encircling the top and chains to hold the lights for extra illumination. The studio had a large safe, which the guide said was mainly to protect the architect's Japanese prints rather than his own work. 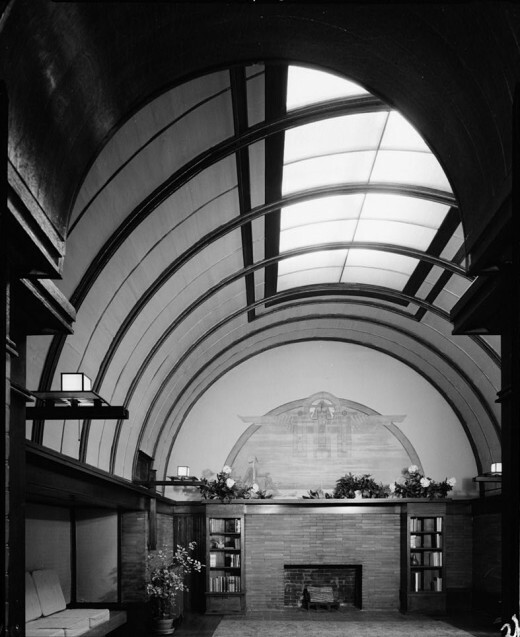 Lloyd Wright entertained the idea of using the studio's smaller octagonal room as an open library for Oak Park residents, but after it was built he decided he needed it for his office. The ceiling here has a design that makes it appear as if it is spinning, and the rooms windows are up high so there's no outside distractions. The tour guide says the ceiling panels' design would later be used by Lloyd Wright for the Guggenheim museum, but it's been decades since I've been to the Guggenheim so I can't remember what the museum's inside looks like. 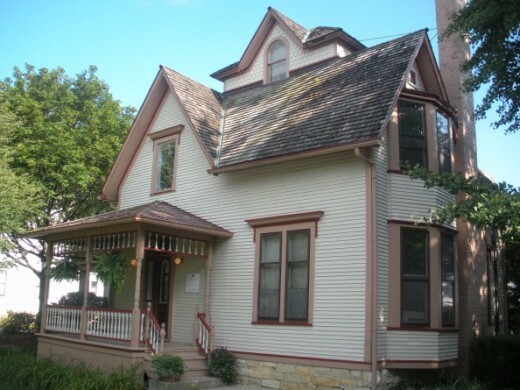 This also includes a short tour around Oak Park highlighting some of the homes in the town that he designed. The tour ends in the back yard, next to this white house. 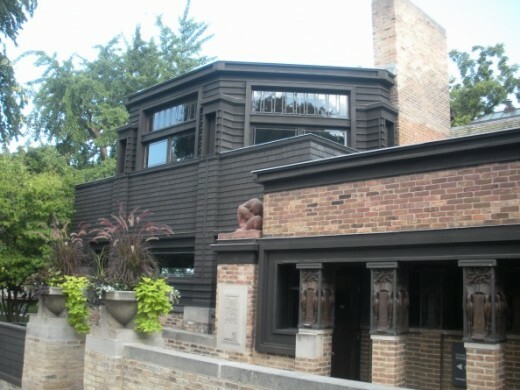 It was the first house built in Oak Park, in 1866, and Lloyd Wright had his mother live there. The tour guide tells us that Lloyd Wright's mother and wife didn't get along at first, but eventually got along well enough that they even went into business together! The tour lasted less than an hour, but we felt we learned a lot about Lloyd Wright and architecture in general. In fact, for the rest of the trip everyone in the family spent more time remarking on the buildings in Chicago than usual. 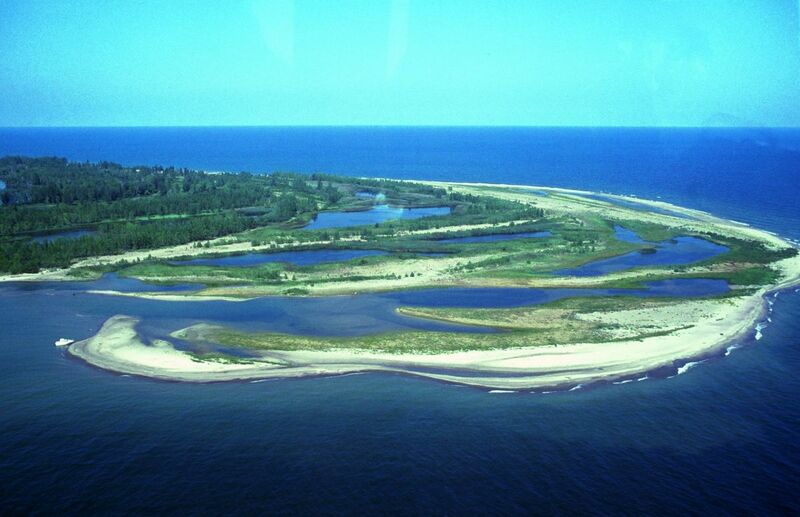 If you are ever in the Chicago area, this is one historical place that we highly recommend. The wikipedia page about the house. The wikipedia page about the architect himself. Have Your Ever Visited Frank Lloyd Wright's Home and Studio? Yes, and we're going again! No, but we're planning on it! No, this isn't for me! We have used Hotels.com to book our recent vacations, and haven't had a problem yet. You do have to spend a bit of time reading the reviews to make sure the hotel you select is exactly what you want, of course. Sometimes a good price just means that the hotel has had a lot of poor reviews and has dropped what it charges to attract customers! Thomas Edison House Glenmont: A New Jersey Family Day Trip! Thomas Edison's Laboratory: A New Jersey Family Day Trip! Highlights of the Library of Congress: Thomas Jefferson, Bob Hope and the Gutenberg Bible! Moon Baltimore Book Review: A Great Little Tourist Guide! 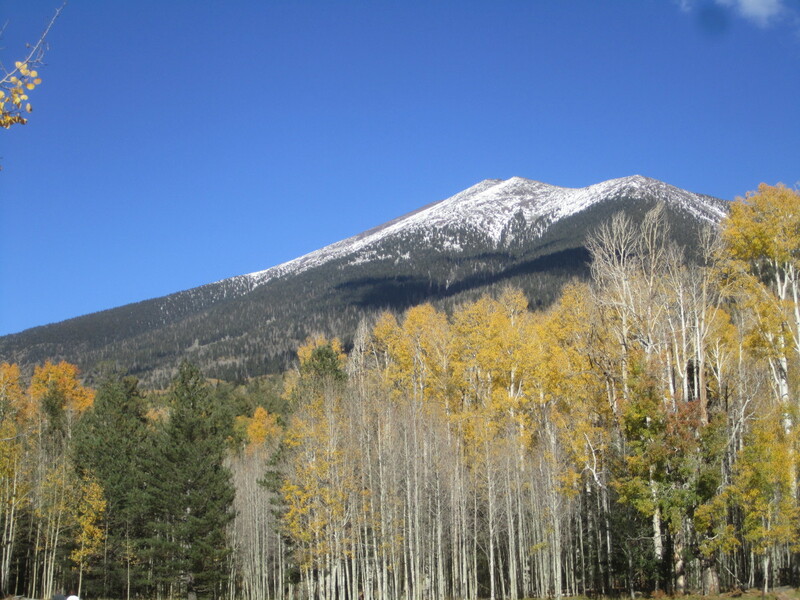 I hope you enjoyed reading this review as much as we enjoyed our travels and writing it. Now it's your turn! Hubby has been looking for places in the US to visit this year so I keep showing him the tourist articles as I come across them. He uses Google maps to scout out routes but seeing the personal accounts and images from people who have visited the historical spots really gives him a good image of where he wants to travel. Yes thanks, it is a really interesting lens, as I have been in the property business in the past. Very interesting tour and would like to see it but too far from the UK! This looks like an interesting tour. Nice photos. I'm a great fan of Frank Lloyd Wright but only know his work from text books. I'm amazed at how eclectic and 'folksy' his house is. Like he took an architectural hand book and just put it all in. Lovely house and great lens. Congrats on your purple star. I haven't seen any of FLW's places, though I moved a few months ago and now live nearer to Falling Waters. I have enjoyed seeing his son's Wayfarer's Chapel in Rancho Palos Verdes, CA. It was beautiful, natural and balanced.